Dhaka, 1 Mar, Abnews: Prime Minister Sheikh Hasina today suggested students to pursue practical education on agriculture, saying that there is nothing of shame to work on land or plant seedlings. The prime minister said this while distributing Bangabandhu Jatiya Krishi Puroshkar 1423,(Bangabandhu National Agriculture Award -1423), the highest state recognition in the agriculture sector, in Osmani Memorial Auditorium here this morning. "We will definitely develop our industrial sector, but not excluding agriculture," she said. The premier said currently many people are raising gardens on the rooftops of their buildings. "Everybody should be encouraged in this work," she said. Sheikh Hasina said every inch of land will have to be utilized properly for boosting the country's agri-production. "The lands of those who are staying in the towns often remain unused. 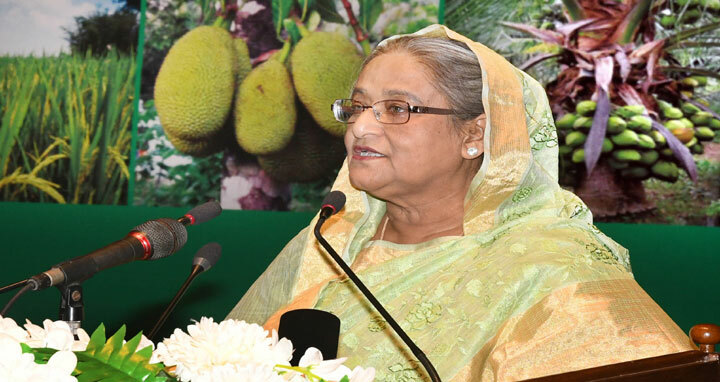 But there will be no dearth of food in Bangladesh, rather we would be able to provide food assistance to the people of other countries if these lands are cultivated under a cooperative system," she said. "We could now plant seedlings and harvest crops through machines instead of hands," she said. Criticising the post-1975 governments as well as the BNP-Jamaat government for not giving a proper attention to the agriculture sector, Sheikh Hasina said those governments didn't want to make the country self-reliant in food rather they wanted to turn Bangladesh into a country of beggars. She said there is a difference of thinking between Awami League and BNP as the Awami League always tried to turn Bangladesh into a self-dignified country. "We want that we will move keeping our head high, not begging hands to others," she said. In this connection, the prime minister mentioned that when her party announced in parliament in 1998 that Bangladesh became self-reliant in food, at that time the opposition BNP said that it's not good for Bangladesh as the country will not get foreign food assistance for it. The prime minister said: "My question was that whether we will move in the entire life in such a way. But we don't want it, we want we would produce food by ourselves ... we will move in the world with dignity." "On the other hand, the BNP government opted to import food from abroad by showing hungry people and doing this they wanted to raise their trade and business and make their pocket heavy ... that was their mentality," she said. Putting emphasis on maintaining continuity of the government, Sheikh Hasina said Bangladesh has already earned due dignity as the country's development is being visible, from food security to the living standard of the people are being improved, their per capita income being increased and the country is being freed from poverty. "Our aim is to establish agro-based industries and we're working to achieve the target," she said. The premier laid stress on expansion of surface irrigation by reducing underground water. "Initiatives will have to be taken for the technologies consistent with the climate change," she said. Sheikh Hasina said the foodgrains production in 2005-06 fiscal year was 2.80 crore MTs, while it increased to 3.87 MTs in 2016-17 fiscal. "We ranked 4th in the world in rice production including attaining food autarky again," she said.